Planning your own wedding no doubt is an exciting venture, but it can be a daunting task to tackle because organizing a wedding requires making hundreds of decisions, and one of the most important decisions made will be where to host it. If searching for a prime wedding venue in Northern California in the neighborhood of one of the largest alpine lakes in the world, Lake Tahoe has no shortage of options when it comes to exceptionality. If it’s an outdoor ceremony you’re seeking, one of the most famed wedding venues in or about Lake Tahoe is on the elevated bluff of Emerald Bay. Towering high above the lake alongside the crescent, mountainous peaks this exceptional site is renowned worldwide, and it is a favorite of brides and grooms looking to exchange their vows in the splendor of the surrounding beauty it provides. 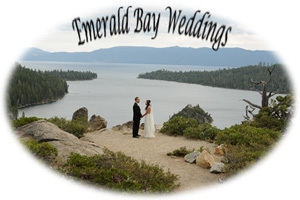 Located along the west shore of Tahoe, Emerald Bay is a short drive from the heart of the city and is available year-round to serve as host for those wanting a spectacular ceremony venue. In contrast, you may want a beachfront wedding where you can walk barefoot in the sand and have a ceremony at the water’s edge. Several fabulous locations that offer such a setting are found along the south shore of Lake Tahoe. Among others, some of the top choices include Regan Beach, Lakeside Beach, and Zephyr Cove. In addition to its natural beauty and serene setting, Regan Beach is noted for its easy access and convenience, and although Lakeside Beach and Zephyr Cove have unique characteristics unto themselves, they all rival in quality. Located within miles of each other, all have the attribute of a panoramic view of Lake Tahoe and the encircling Sierra Nevada Mountain Range. If you are contemplating having an indoor wedding, Valhalla Grand Hall is amid the best location around. It has a reputation of distinction and is an exceptional wedding and reception facility that’s geared toward large, formal weddings. Located along the west shore of Tahoe just north of Camp Richardson, the historic, Scandinavian-style edifice is situated on U.S. Forest Service land amongst the wilderness. Built in the 1920’s, it was once the home of the pioneer Heller family, but now is a focal point for weddings and other events. Other top choices for an indoor venue lie along the main street in the heart of town. 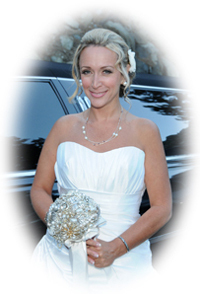 Tahoe Lakefront Weddings is a one of a kind chapel that sits adjacent to the water, offering spectacular views of the lake as far as the eye can see. An attached terrace provides the bride and groom the option to move the event outdoors if so desired. Additional alternatives for indoor locations in South Lake Tahoe include Chapel of the Bells, The Beach Retreat and Lodge, Harvey’s Wedding Chapel, and Forest Suites Resort to name just a few of the more noticeable. 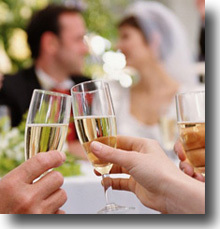 Each has its own characteristics and charm, affording couples an intimate and picturesque wedding. With a plethora of indoor and outdoor choices of top-notch wedding venues, it is no wonder why Lake Tahoe rates high in popularity for destination weddings. If planning a wedding and the selection of a location necessitates a unique and intimate setting, you’ll discover some amazing places once you begin exploring the wedding venue possibilities in Lake Tahoe.